Wondering what to do with too many tomatoes? Check out these 4 quick and easy ways to use tomatoes. Late-summer tomatoes are at their peak now and local gardens and farmer’s markets are bursting with them. It’s the perfect time to enjoy their sweet flavour and texture. Pick up some local red or yellow tomatoes, find a basket or two of cherry tomatoes, or search for the bumpy, stripy heirloom varieties, but get them now before they disappear until next summer. 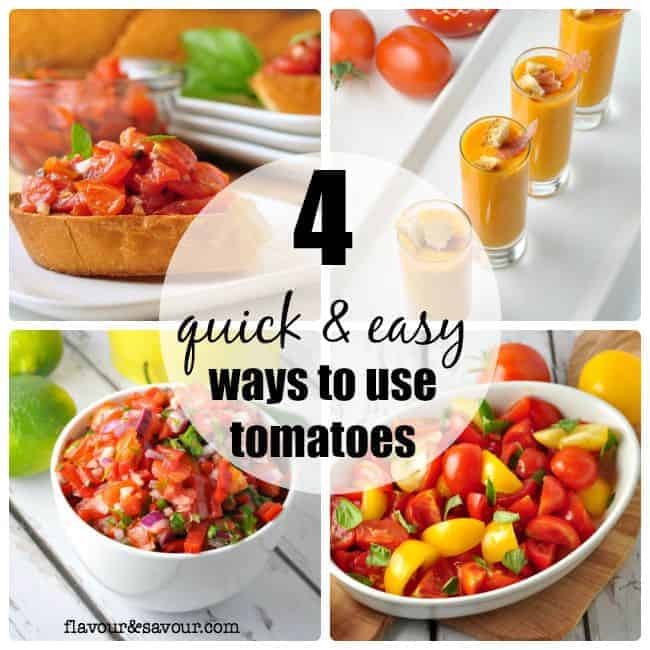 If you have a surplus and are wondering what to do with them all, here are four quick and easy ways to use tomatoes. 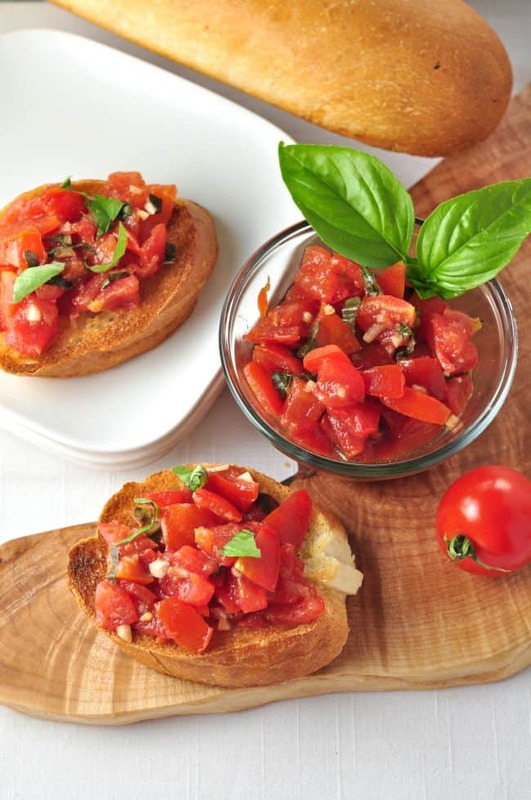 Choose from Classic Tomato Bruschetta (who doesn’t love that? ), Salmorejo (a chilled tomato soup that doesn’t sound good, but oh! just wait until you try it! 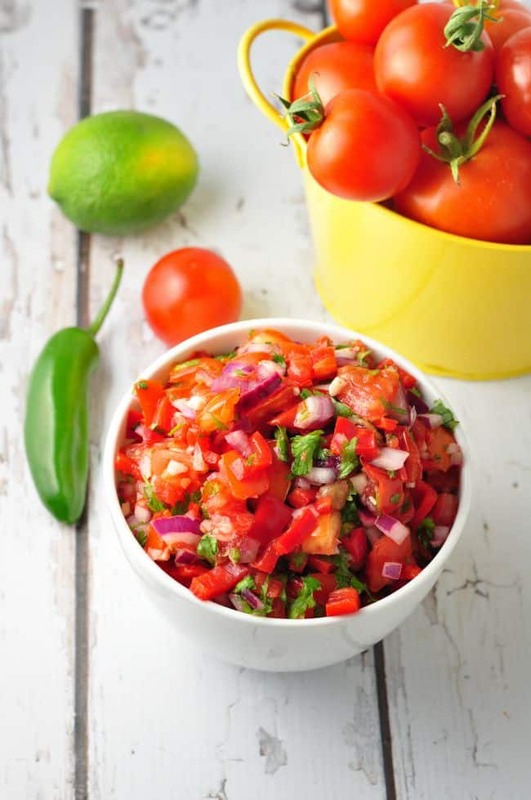 ), Pico de Gallo (fresh salsa) and a Rustic Tomato Salad. 1. Classic Tomato Bruschetta Sun-ripened tomatoes, fresh basil, garlic and a healthy dose of olive oil and balsamic vinegar on crusty bread makes an appetizer that everyone loves. Imagine yourself under the Tuscan sun. 2. 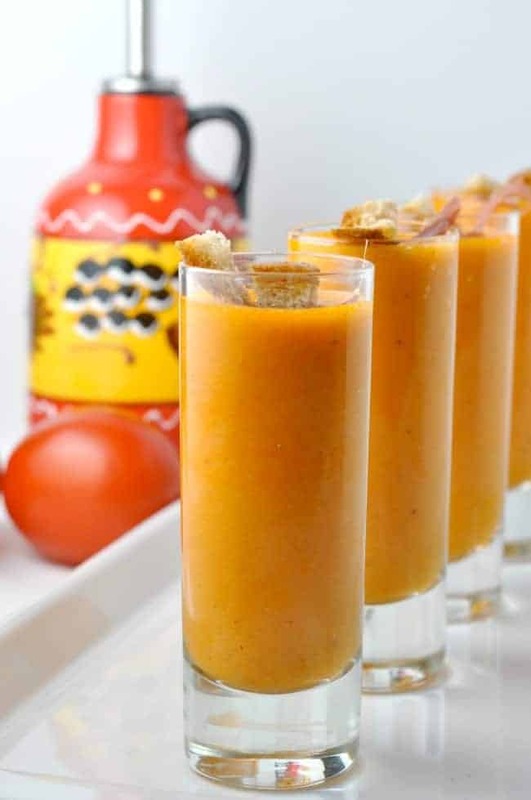 Salmorejo–Chilled Tomato Soup Scrumptious little Spanish soup shots. 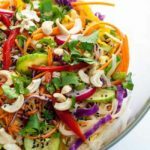 Better than Gazpacho! A chilled tomato soup that’s quick to whip up in your blender. 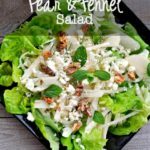 Top with a tiny crouton and a sliver of cured ham like Serrano or Prosciutto. 3. 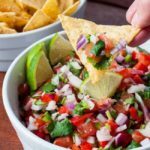 Pico de Gallo Fresh salsa for your Tex-Mex meals or snacks. 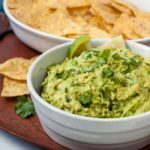 Serve with tortilla chips, tacos, burritos, quesadillas, burgers, or with grilled shrimp. So much better than that stuff in the jar. 4. Rustic Tomato Salad Five minutes to top-drawer tomatoes! 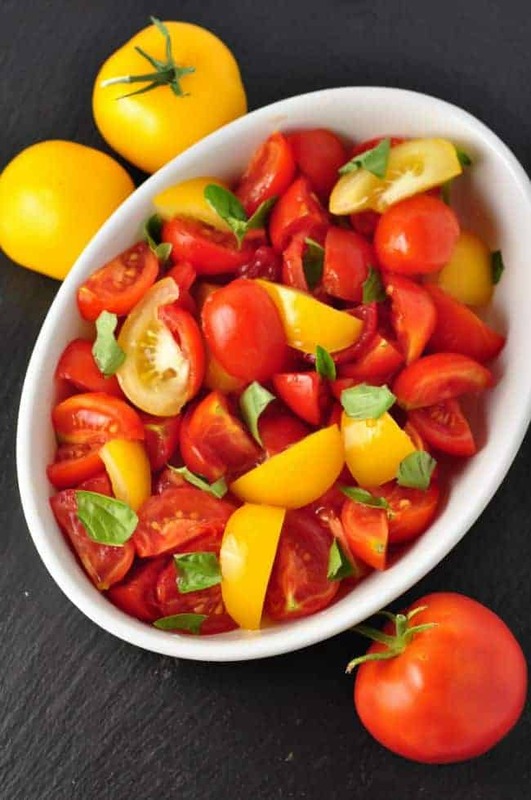 Tease even more flavour from fresh tomatoes in this simple but spectacular salad. If you make one of these recipes, be sure to snap a pic, Instagram it tag me @flavourandsavour so I’ll see it and hashtag it #flavourandsavour. I’d love to see what you make!